Hear an audio sample of "The Adventures of Doc Savage"
Almost all attempts to adapt Doc Savage into other media have been valiant failures. Just ask legendary producer-director George Pal. With such classics as "The Time Machine" and "The War of the Worlds" to his credit, he purchased the rights to all 181 original novels starring Street & Smith's iconic pulp superman, and expressed unbounded confidence that his 1975 film "Doc Savage: The Man of Bronze" would spin off countless sequels. Instead the film sank Pal's career. At least he got a movie out of it. A decade before, Chuck Connors was poised to star as Doc in "The Thousand-Headed Man", with five sequels right behind it. That project never went to camera. Numerous versions of Doc Savage have appeared in comic books - some good, some bad, most indifferent. Despite being the inspiration for such popular culture titans as Superman, Batman, the Man from U.N.C.L.E., Star Trek's "Mr. Spock", Buckaroo Banzai, and Marvel Comics' the Fantastic Four, the metallic magic of Doc has proven hard to recapture outside the pages of the original "Doc Savage" pulp magazine. The curse goes back to Doc's inaugural year of 1933, when flushed with the success of his new superhero, writer Lester Dent - the man behind the storied pseudonym of Kenneth Robeson - tried to peddle the Man of Bronze to radio. His vision was a simple one. Dent intended to adapt his own novels in serial form. But instead of half-hour installments, he was forced by his sponsor (the Knox Company, makers of a patent medicine called Cystex) to script self-contained stories only 15 minutes long, limiting the cast to Doc and his apish foil, Monk Mayfair. All the wild, pulpy action that made Doc Savage a Depression hit was squeezed into a container too small for it. That first radio adaptation ran for 26 episodes over Don Lee's twelve-station Golden West radio network, beginning on February 11, 1934, at 9:00 PM. It scored so well with California listeners that it was syndicated nationally that fall, beginning October 6th. As with so much of pioneering radio drama, the show proved so ephemeral that no transcription disks or cast information have survived. It remains one of radio's lost gems. A decade later, Street & Smith floated a sustaining show based on their Doc Savage comic book. It ran over New York's WMCA in 1943. That version wasn't the true Man of Bronze, but an imposter tricked out in a mystic ruby-studded hood acquired in The Shadow's birthplace of Tibet. Audiences groaned and changed the dial. So after 26 broadcasts, it too vanished from memory. Fifty years after Lester Dent gave it his all, producer-director Roger Rittner of the LA-based Variety Arts Radio Theatre took a shot at bringing Doc Savage back to the airwaves. The Bantam Books paperback reprints had been going strong for two decades. The memory of the George Pal fiasco had begun to fade. It seemed time to try again. Once in a while, someone gets it right. Roger got it right. He managed to do what Lester Dent and everyone else failed to accomplish. He convinced National Public Radio to let him serialize two vintage Doc novels. No campy changes, no updating, just pure unadulterated Doc Savage-style high adventure. The Adventures of Doc Savage as the title Roger gave to the most true, most faithful, and most perfect media incarnation of the Man of Bronze ever broadcast. Aided and abetted by yours truly (just making a name for myself as the latter day Kenneth Robeson whose posthumous collaborations with the late Lester Dent eventually resulted in a series of well-received Doc novels) Roger combed the Doc Savage canon for suitable stories to serialize. Driven by his strong desire to include the adventurous Patricia Savage in the production, Roger decided to adapt Dent's 1934 adventure "Fear Cay" in seven parts. Set in New York, Florida, and the mysterious Caribbean isle of Fear Cay, it pits Doc Savage and his two-fisted crew of experts against the bizarre seaman, Dan Thunden, who claims to be 130 years old and the discoverer of the Fountain of Youth. But is this bearded hellraiser all that he claims to be? When directing the action extravaganza "Fear Cay", Roger was inspired by Republic Pictures' "Adventures of Captain Marvel" serial, with added touches from the popular "Terry and the Pirates" radio show. This last choice was a serendipitous one: in 1939, Lester Dent scripted a multi-part adaptation of "The Polar Treasure" for a radio venture that never materialized. He modeled that project on "Terry and the Pirates" too! "I tried to make this series sound the way 1940s movie serials looked," Roger explains. "I don't want to say there's no depth to them, because I think there's a great deal of depth to them, but our emphasis was always on action. Not letting too long a period go by when something doesn't happen. Oddly enough, Dent's writing style fell just perfectly into a half-hour format. Each half hour as it went through the books, seemed to build nicely. There was a little bit of exposition at points that built up to a nice climax at the end of each chapter. Without too much messing around, I think we adapted "Fear Cay" fairly religiously in terms of the plot and the characters." Taking a different approach, I chose to adapt "The Thousand-Headed Man" in six chapters. Inspired by the abortive Chuck Connors film-that-never-was and my interest in evoking Carleton E. Morse's classic "I Love a Mystery" radio serials, I focused on the mood, mystery and atmospheric horror of Doc Savage's quest for a lost expedition in 1934 Indo-China which brings the Man of Bronze in direct combat with the half-mythical menace known only as the Thousand-Headed Man. From foggy London to the ruined and serpent-haunted City of the Thousand-Headed Man, Doc and his team confront escalating jungle horrors culminating in a blood-freezing climax. I had a blast doing it. But after the scripts were completed, the project ground to a halt for practical reasons: money. National Public Radio was going through a budgetary crunch. The search for funding took three long years. It seemed as if "The Adventures of Doc Savage" was destined to remain but a shining bronze-and-gold dream. Finally, a few small grants came through to underwrite the production. 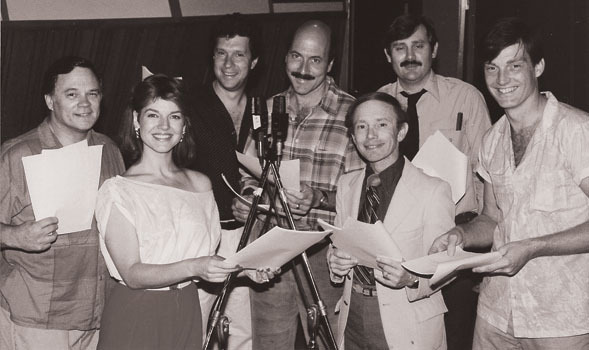 The two serials were then recorded over the summer of 1985 in the EFX Systems studios in Burbank, California. In another strange synchronicity, the 1934 Doc Savage radio series was also recorded in California - most likely in San Francisco. Gathering together an ensemble cast of multi-media performers who had worked him with on previous modern-day radio dramas like "Darkness" and "Midnight", Roger cast Daniel Chodos as Doc Savage and Robin Riker in the role of Pat Savage. Other performers included Robert Towers as Monk Mayfair, Art Dutch was Ham Brooks, Bill Ratner played Renny Renwick, with Scott McKenna and Kimit Muston standing in for Long Tom Roberts and Johnny Littlejohn respectively. "The Adventures of Doc Savage" premiered at 7:30 PM on Monday, September 30, 1985 as part of the "NPR Playhouse" umbrella series. It ran for thirteen exciting episodes with "Kidnapped", Chapter 1 of "Fear Cay", kicking off the show. (A few stations inexplicably swapped the order and ran "Thousand-Headed Man" first.) It has never been commercially available, although a brisk trade in bootleg tapes and CD's has continued uninterrupted over the intervening decades. Now timed for the 25th anniversary of this acclaimed series, Radio Archives is proud to present the complete original series, remastered and digitally augmented, along with a new audio documentary, "The Sound of Bronze: Making The Adventures of Doc Savage," featuring the cast and crew commenting on the production, and a stunning collectable cover depicting Doc and Pat Savage by Bantam Books Doc Savage artist Bob Larkin. Doc Savage was originally created for pulp magazines, but with an eye toward radio. Like his big brother, The Shadow, Doc was given a signature sound in the expectation that he would need one to identify himself to radio audiences. Doc's eerie trilling, like The Shadow's distinctive laugh, signaled his presence. Once more that uncanny sound, described by Lester Dent as "eerie, with the essence of the Orient in it," announces that the mighty Man of Bronze has returned. Back in the day, Roger Rittner did Doc Savage right. Now Radio Archives is doing it bigger, bronzer, and better! The Sound of Bronze: Making "The Adventures of Doc Savage"
Will Murray is the author of over 60 novels in popular series ranging from The Destroyer to Mars Attacks. Collaborating posthumously with the legendary Lester Dent, he has written to date numerous Doc Savage novels, with Skull Island, Death’s Dark Domain, Desert Demons, Horror in Gold, and The Ice Genius among those now available. For National Public Radio, Murray adapted The Thousand-Headed Man for The Adventures of Doc Savage in 1985, and recently edited Doc Savage: The Lost Radio Scripts of Lester Dent for Moonstone Books. He is versed in all things pulp. Roger Rittner has written, produced, and directed audio drama specials and multi-part series, including the drama series Darkness, the mystery/macabre series Midnight, The Adventures of Doc Savage, the Western musical comedy Rhythm Rides the Range, and the musical special Charlie Sent Me! His radio projects have been heard on National Public Radio, as well as stations KMPC, KFI, KCSN, and KGBS in Los Angeles. 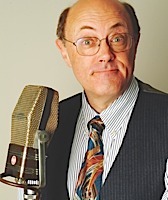 Roger created and directed The Variety Arts Radio Theatre, live recreations of classic radio drama, for 10 years at the Variety Arts Center in Los Angeles. 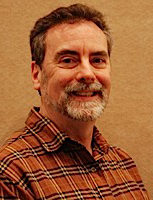 In addition to producing audiobooks for RadioArchives.com, Roger produces his series of audio versions of classic pulp short stories, Pulp Radio. In his off-hours, his company, Roger Rittner Productions, creates marketing and promotional audios and videos for corporate clients. I've heard a lot about this one. I'm looking forward to listening to it. Twenty-five years ago I had a standing appointment with NPR once a week in order to listen to the single best adaptation of Doc Savage to a medium other than the pulps - the radio adaptations of Fear Cay and The Thousand-Headed Man. Roger Rittner and his crew did an exceptional job, with well-adapted stories, excellent voice talent (with one slight exception), and good production values. To learn that this series is at last available in authorized editions with remastered sound is something worth celebrating. The only (minor) complaint is with Daniel Chodos as Doc - while he does a good job in getting across the normally inexpressive Doc, his voice is a little higher than I would think Doc's would be. But overall this is a great series, and it's a shame the funding didn't come through for a sequel: I would have loved to have heard an adaptation of the John Sunlight stories done by this team!